It’s a unique and trendy thing in the Russian-speaking segment of the web – to put a round bracket at the end of a sentence to express friendliness without acting too emotional. However, it often confuses foreigners. “Whatever” is a bit too much; you’re unlikely to find a closing parenthesis in a scientific report or an official document. But in informal texting, or on the internet – yes, we do love brackets. And here’s why. 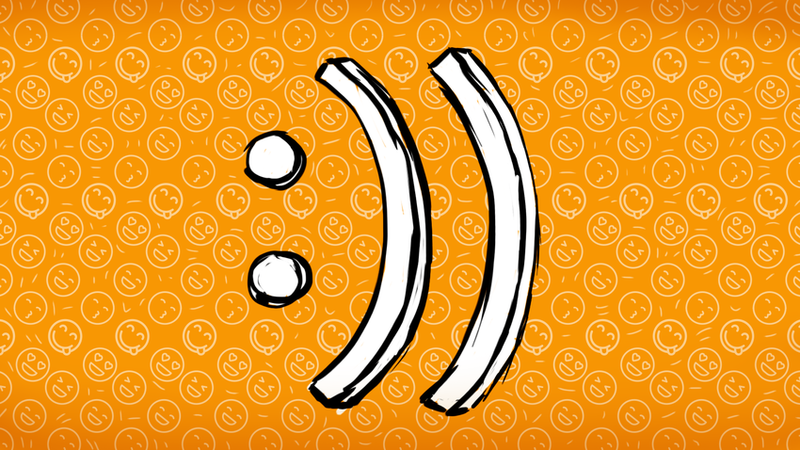 Closing brackets are the origin of the smiley. One of the greatest Russian writers Vladimir Nabokov was among the first to conclude that people need smileys. When he was asked in 1969 where he would put himself among most prominent authors in history, Nabokov answered humbly and with great wit. “I often think there should exist a special typographical sign for a smile; some sort of concave mark, a supine round bracket, which I would now like to trace in reply to your question.” Sounds familiar? Yes, it’s the good old smiley! Then it turned to :) But Russians took it to a whole new level, losing the colon and just adding a round bracket to a previous word. Every Russian has a different way to explain why they prefer round brackets. Some just say, “it’s shorter.” But it’s not all about brevity or laziness. Brackets have another meaning – using them Russians show they are friendly, polite and feel good about the conversation. It doesn’t necessarily mean something’s funny. As Anastasia Vozhakova, one of the users of TheQuestion.com (Russian version of Quora), put it while answering a question about parentheses, “it’s almost a polite dot.” She meant that Russians are so used to round brackets that now someone neglecting them in informal texting may even look angry or impolite. Emojis, according to her, are too emotional. This bracket thing is so common in Russia that we use it almost unconsciously, having no idea foreigners don’t have the habit and when confronted think “What the hell is that?” Some people get confused with Russians’ manner of communicating. Seven years later maybe a bit late, but we can answer him now. You shouldn’t interpret that at all, Edmund! Just buy the guy his darn beer and cigarettes! Round brackets mean actually nothing; it’s just a way to look communicable. At the same time, there are some nuances. The number of parentheses matters: if it’s “)” it’s politeness only. If it’s “))” that’s the sign the person you text with really finds something funny. If it’s “)))” he or she is laughing out loud. And if it’s something like “))))))))))))”, he or she is really overusing it. Normally, people familiar with internet culture don’t do that. Why are there so many guards in Russia? Iron ladies: Who are Russia’s ubiquitous concierges, and why do they ask so many questions?